‘Ole Miss after Meredith: Progress since 1962’ was one of several lectures to observe the 50th anniversary of integration at the university. Students hold electric candles and sing at UM’s commemoration of 50 years of integration. Performer Harry Belafonte delivers the keynote address at the ‘50 Years of Integration: Opening the Closed Society’ event on Oct. 1, 2012. U.S. marshals donate a book to the J.D. Williams Library. A student takes a photograph of the James Meredith statue on the UM campus. James Meredith visits Oxford for a book signing. Chancellor Dan Jones leads a group during a walk across campus, retracing the steps James Meredith took 50 years ago on his first day of enrollment at Ole Miss. In 1956, the Virginia Legislature called for massive resistance to school desegregation and pledged to close schools under desegregation orders. That same year, under court order, the University of Alabama admitted Autherine Lucy, its first African-American student. White students and residents rioted, and Lucy was suspended and later expelled for criticizing the university. In 1957, President Dwight D. Eisenhower responded to defiance in Little Rock by sending a thousand paratroopers from the 101st Airborne Division to ensure the enrollment of nine black pupils at the city’s Central High School after Arkansas Gov. Orval Faubus used the National Guard to turn back the children. In 1961, a federal district court ordered the University of Georgia to admit African-American students Hamilton Holmes and Charlayne Hunter. After a riot on campus, the two were suspended. A court later reinstated them. In 1962, a federal appeals court ordered the University of Mississippi to admit James Meredith, an African-American student. Upon his arrival, a mob of more than 2,000 white people rioted; two people were killed. In 1963, two African-American students, Vivian Malone and James A. Hood, successfully registered at the University of Alabama despite Gov. George Wallace’s “stand in the schoolhouse door” – but only after President Kennedy federalized the Alabama National Guard. University of Alabama became the last Southern state university to desegregate. Today, these historical events serve as markers of how far we’ve come as a nation, a state and a university, and they encourage us to work even harder to serve as a positive example of the benefits of diversity and inclusion. In October 2012, UM commemorated the 50th anniversary of its integration, an event that profoundly impacted this university’s vision and character. We see the next 50 years as a time to achieve more – to establish the highest levels of academic excellence, to prepare great leaders for every profession, to increase service projects across Mississippi and around the world, and to open the doors of higher education to all students willing to do the work required by a leading university, whatever their race, nationality, background or economic circumstance. We invite you to explore this website to learn more about James Meredith and the university as it was in 1962 and as it is today — a place that demonstrates an unwavering commitment to change and progress. 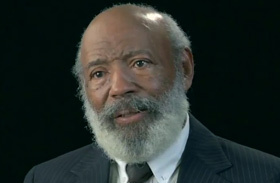 Watch a video about the legacy of James Meredith. Produced by Media and Documentary Projects. Watch more in the Video Gallery. 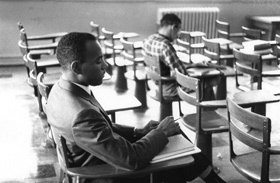 View a photo gallery of James Meredith as he attends his first classes at Ole Miss. Photos courtesy of Ed Meek.